Date: November 13, 2018.~ August 12, 2019. At the end of July 2018, DOC. PenPen, founder of the Pentasi B World Friendship Poetry, father of visual Poetry and Chinese well-known English Poet and translator Sophy Chen, founder of “Sophy Poetry & International Translation Website” and “Sophy Poetry & Translation” C-E international magazine, met in Manila, the capital of the Philippines. The two sides signed a media memo on Pentasi B World Poetry Festival in mainland China in 2019, which marked the upcoming Pentasi B China’s first World Poetry Festival. PENTASI B World Poetry (Festival) was initiated by DOC. PenPen, and has been successfully held in many countries. Its operation mechanism is simple and mature; This time Chinese English poet and translator Sophy Chen was authorized to introduce it into China and she will host it as sponsor in China in her own name, and she has independently launched the “Sophy Chen World Poetry Award”. Under the conditions of global integration of society and economy, international poetry has become more modern, living and globalized, but facing with the human spiritual proposition, poetry has remained unchanged; if Chinese poets would like to go to international poetry world and build bridges of friendship for global harmony & understanding among people of all nations by their peoms, we, poets, must work together through translators and poets oursevles. The Pentasi B China World Poetry Festival And Sophy Chen World Poetry Award have a direct connection to the world with the theme of “Poetry and Globalization”, accelerating activities and exchanges of the internationalization of Chinese poetry and the world poetry and promoting dialogue and exchange them. All award-winning poets will be highly regarded by the this festival for the supreme world poet honor and global media coverage. Special Note: This poetry festival is the English-Chinese bilingual poetry festival, so all of the text and materials need to be translated into English or Chinese. We will translate them according to the order of submission. If your manuscripts are submitted after May 13th, 2019, also later to August 13th, 2019, they cannot be translated before book number application, your poems can not be put into the book. (2) The poets’ books and gifts exchanges, as well as cultural gifts in 2019. (4) The poets’ books and gifts exchanges, as well as cultural gifts in 2019. (1) The poems of the Chinese award-winning poets, the world award-winning poets and all nominated poets will be published in English and Chinese in a poetry collection –“Pentasi B 2019 China World Poetry Festival and Sophy Chen World Poetry Award, Poems From Awarding Poets and Selected Poets” (tentative name); The number of poets of this book will be selected according to the number of submissions and artistic quality. Non-poetry nominees may not be selected for this selection. (2) All the award-winning works and nominated works of the poetry festival will be translated and put in “Sophy Poetry & Translation” (E-C), international magazine, which will be gradually promoted. 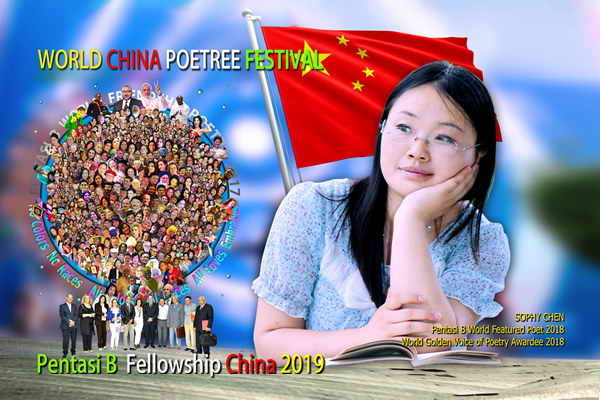 (3) In addition, we will build a new home website for this poetry festival to promote the details of this international poetry festival, 2019 selected poets and works of the award-winning poets. Chinese: First selection language of Chinese poet’s submission. PENTASI B 2019 China World Poetry Festival And Sophy Chen World Poetry Award will not publish the specific list of judges. Doc. PenPen and translator Sophy Chen have the final decision on the final list of award winning poets and serials of award winning poets of the poetry festival. l.become the network communication spokesmen and witnesses of the poetry festival in their own nations. We are responsible for selecting and screening all the Chinese poems, and calculating the translation labor fees for submitted poets according to the number of submitted lines. After the poets pay the fees and sign the translation agreement, they enter the next round of selection. 1. In order to let more readers read the representative works of the Chinese poets in the contest and fully display their creative level, influence and network activity, we will show all the poet’s image, profile and 5-10 their masterpieces in the vote. 2. Participants must first add the “Sophy English Online and Sophy Poetry & Translation” wechat service number before they can vote with their own WeChat. Each online voter can give each poet a vote every day. 3. Online Voting WeChat Platform (Sophy English Online and Sophy Poetry & Translation). The other languages poems translation into Chinese in this festival was exclusively translated and sponsored to publish by the translator Sophy Chen. The list of overseas award-winning poets and delegates are invited and recommended by Doc Penpen and Sophy Chen according to the quality and international influence of the poets. 1. Participant Requirements：Age, gender, nationality and race are not limited. Everyone, healthy, active in the poetry world, up-to-date, and interested in the grand exhibition of international poetry with international reference and forward-looking, can submit his or her manuscript. We are willing to award poets who actively share the links that have works of Sophy Chen translation and who strongly support the poetry translation of Sophy Chen. Those who do not actively promote themselves and their own English-Chinese translated poetry, do not share their translated poems to their personal homepages, friends circle, no matter what level you are, we will refuse to translate for you and refuse to award you. 2. Genre and Theme: this poetry event is limited to Chinese modern poetry. The theme of poetry is not limited. It requires the works to have profound ideological content, unique artistic innovation, and deep emotional experience. 1.Please Chinese poets personally send more than 10 Chinese poems / more than 200 lines of poems that have not been translated into English and bio within 50 words(do not write any words not besed on poetry) (no more than 10 poems / no more than 200 lines of poems will not be translated or participated in the international competitions. And less than 3 poems/ less than 50 lines will not be translated and published.) The poets’ standard bio is less than 300 words. The poet’s standard image one (write names, large size, at least 1000 pixels at a normal 72 resolution. ). Mail address, phone number, qq and weichat. Translation labor costs: 15 RMB / per line of Chinese new poetry into English and brief introduction of 50 words of sponsor translation. 3. Please arrange the poems by their stanzaes. Manuscripts directly pasted on the Internet, directly pasted into the text box of the mail and images not named will be considered invalid. 4.All Chinese poems will be reviewed by the editorial board of “Sophy Poetry & Translation”. If the poetry has its considerable creative level, translation and international promotion value, we will publicly issue a list of newly selected poets, and after the poet paied the translation of related works, the poetry will be eligible to be translated into English to participate in the overseas English poets selection of the competition. 5.All poems in this competition are independently translated by Sophy Chen herself. In order to protect the copyright of the poet’s works and translated works, all the manuscripts are regarded as the poets personally authorize Sophy Chen to translate and personally recognize the translation agreement receipt. If your works have been translated and published by other translators, which caused the translation copyright disputes, Sophy Chen is not responsible for it. 6. We do not mind your poems have been published in other publications or not but they must be your personal original works and we do not allow you copy other poets’ works, so once we found it your award qualification will be cancelled. From now until August 12, 2019. Contributors must add Sophy Chen’s WeChat, WeChat public account “Sophy English Online, Sophy Poetry & Translation” or QQ. When adding WeChat and qq, please write “Which contributor poet you are” to ensure that it is added. We will provide excellent returns for co-organizers, cooperation or sponsors. If you are interested, please contact Sophy Chen to discuss! Sophy Chen, her name, Lihua and family name, Chen, born in Lueyang, Hanzhong, Shannxi Provinve, China, is the Chinese contemporary poetess, translator, and American English “Legendary Poet”. She is the founder of “Sophy Poetry & Translation Website”, “Sophy Poetry & Translation” International Magazine and “Sophy International Translation Publishing House” and the founder and leading lecturer of “Sophy English Forum”. She graduated from English Institute of Xi’an Foreign Studies University in English Literature. She began to write Chinese poetry in 1989 and English poetry in 2004, and she began to translate Chinese Poetry into English poetry and English poetry into Chinese poetry in 2005. She won the annual “International Best Translator” Award 2012(C-E)and the Chinese Contemporary Poetry (2013-2014) Translation Award(C-E). PENTASI B WORLD INSPIRATIONAL POET 2018 and World Featured Poet 2018(E-E). Admin Of PENTASI B World Friendship Poetry. Host, Organizer & Sponsor of PENTASI B CHINA WORLD POETREE FESTIVAL 2019. PENTASI B WORLD GOLDEN VOICE POETRY 2019. She translated and published six Chinese poetry collections into English, The Flower Swaying (2014) , The Tibetan Incense(2014), The Outlook of Life (2014), The Different Tunes (2014), The Body Forward (2015), and A Poetry Biography for White Snake (2015), etc. Her English original poetry collection, Sophy English Sonnets, Tuberose, only 8 poems, published in Amazon in E-book. It is the first international poetry translation website of China, which is organized in Sophy Chen’s own name as a translator and poetess, in Chinese-English, and which is committed to translate and promote the excellent Chinese poetry and excellent international poetry. Since its opening on October 8, 2014, holding its poetry translation idea of “rigorousness, excellence, and vividness,” publishes, it has been highly regarded in poetry at home and abroad, and has become an international translation portal for Chinese and foreign poets. In the website in addition to some individual columns’ poetry translated by other translators, all of English-Chinese and Chinese-English poetry are independently translated by Sophy Chen. The International Magzine “Sophy Poetry & Translation” (English-Chinese) was founded by Sophy Chen (Chen Lihua), a well-known Chinese English poet and translator of English-Chinese translation. It was founded on: February 8, 2018. First issue publication date: July 28, 2018. The language is English. Title: Sophy Poetry & Translation. International Journal Number (paper) ISSN: 2616-2660, (e-book) ISSN: 2616-5058. It is dedicated to strengthening Chinese and international excellent poetry translation and internationalization and promoting the mutual translation, interaction, communication and exchange of Chinese and Western poets’ excellent poetry. Taking Chinese-English translation as the leading factor, it promotes the international interaction and communication of poetry in other languages. At present, all English-Chinese or Chinese-English poetry works in each column are independently translated by Sophy Chen. ● Received the honor and title in Accra, Ghana as FATHER OF HUMANITARIAN POETRY, 2018. ● Received the honor and title in Accra, Ghana as KING OF KINGS of VISIONARY POETRY, 2018. ●The former State Minister and Current Member of the Parliament, Hon.Rashid Pelpuoannounced and endorsed Doc Penpen for a National Award to be received in the Parliament of the Republic of Ghana. This is so amazing. And I’m so glad to be part of this and much willing to render any support. Much success and greatness are my wishes for you and this wonderful event.